Mochi is a glutenous/sticky Japanese rice cake. It is traditionally served in Japan around the Japanese New Year. It is used for sweets and ice cream but also served with soup and other dishes. Mochitsuki is the traditional mochi-pounding ceremony in Japan. The cooked rice is pounded with wooden mallets (kine) in a traditional mortar (usu). Two people will alternate the work, one pounding and the other turning and wetting the mochi. They must keep a steady rhythm or they may accidentally injure one another with the heavy kine. The sticky mass is then formed into various shapes (usually a sphere or cube). On January 4th we went to Matsuhisa for my Mom’s birthday dinner. There were 4 of us and we probably had about 12 dishes between us all. Everything was pretty amazing. One of the most unique combinations was asparagus tips with a hollandaise sauce and salmon eggs. Fish eggs have become my favorite food this winter. The hollandaise was not too thick so all the textures combined just perfectly. 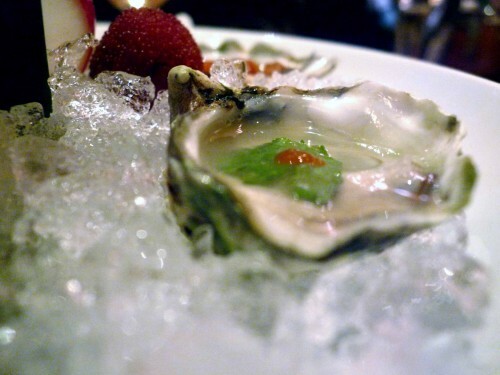 My 2 favorites though were the oysters and the Mochi ice cream. We ordered a half dozen of oysters, they never told us what kind they were, but they were amazing. This one had a cilantro leaf, lime juice, and touch of sriracha. The red/pink in the background is a Japanese peach. It was delicious. 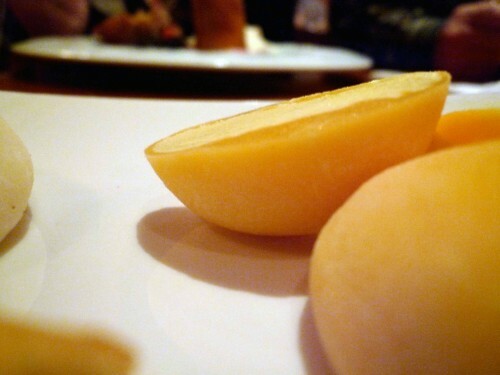 Then came the house made Mochi Ice Cream. More on Mochi in the next post. I’ve only recently discovered this amazing food item. You can buy loads of different Mochi at Sunrise here in Knoxville and Nama serves it sometimes for dessert. Yum. This was mango and vanilla. In my previous post I linked to the Southern Foodways Alliance site. I learned about them years ago when my dad was involved in food-writing. His area of specialty was Appalachian food. On Saturday I was lucky enough to attend their annual fundraiser dinner at Blackberry Farm. Blackberry hosts the SFA and attendees for the weekend but we were only able to make the dinner. The dinner is the culmination of the weekend and featured 6 course featuring the hottest Southern chefs: John Sheilds, Adam Cooke, Ashley Christensen, Joe Truex, Edward Lee, Karen Urie Shields. Each course was extravagant and layered in it’s complexity. There was Smoked Steelhead Roe in a Scrambled Egg Mousse. There was a Braised Pork Shoulder served with a Wild Boar Chop. There was Carolina Gold Rice with Wild Snails that was part of a duck dish. But the course that was the most amazing, in my mind all the parts worked together to make a whole dish was a Rabbit Sausage with Cider Braised Collards and Caramelized Apple. The Rabbit Sausage was served sausage patty style but it was thick and light. The greens had a bit of a spicy bite to them at the end. It was a perfect dish. Here’s a round up of Knoxville Food Finds from some local eaters. I discovered Aroma Cafe – Cuban restaurant in Eagleton Village (between Vestal and Maryville) – they have ridiculously good Cuban snadwiches, Tostones, and Papas Rellenos. Super Asian Market on Sutherland. I’ll go there just to look at packaging. This is random but the first thing off the top of my head is about my love of philly cheesesteak sandwiches.Â oddly enough, the best i’ve found in town is at Holy Land Market.Â add jalepenos and you have my favorite sandwich in town. Favorite places in K-town…. Butler and Bailey for quality meats and Hong Kong house is one of my favorites for real Chinese food. My favorite restaurant is by far the Northshore Brasserie. Â I don’t think many people know about it due to location / lack of advertising. I like the Yacht Club for cheap & dirty beer. Let’s see, Holy Land Grocery, I Love New York Pizza, and the fried green tomato cart lady in front of AmVets- if she is still there. Full Service BBQ in Maryville and Ali Baba’s. About 5 years ago I took a year off. The travels began in February in Paris where it snowed for the first time in 15 years. It was cold, I had a big sleeping bag of a jacket looking as unfashionable as you can in the most fashionable city in the world. I was warm though. Walking the streets of a somewhat recently internationalized Paris, I found an amazing Japanese Ramen restaurant. I had to talk myself out of going everyday, it was instant warmth when you walked in. The steam from all the noodles, the small space, the bustling. Japanese noodles became my new comfort food. Last night in was getting cold, it was late, and we at Mockingbird headquarters were hungry. 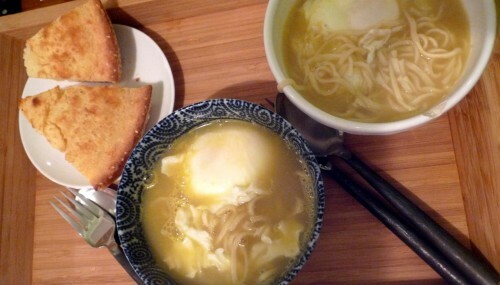 Japanese noodles, chicken broth, a poached egg, and an old standby cornbread did just the trick. It was full on comfort. Every Thanksgiving it seems my Dad and I get into an argument about salt and how it tastes. He says salt, is salt, is salt. It all tastes the same. Every year we do a tasted test because I have no less than 6 different kinds of salt at my house right now, and every year he admits that different salt does indeed taste differently. For a while I was obsessing over pink Himalayan but now Iâ€™ve discovered Maldon Sea Salt. Itâ€™s a British salt and is flaky and salty and wonderful. You can eat the flakes by themselves it is so utterly perfect. 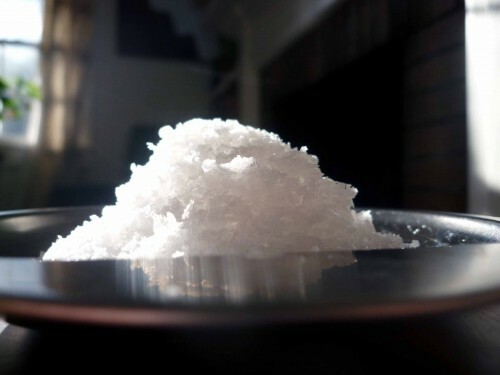 â€œMaldon Salt relies on the favourable conditions which have given east coast sea salt its unique flavour for centuries. The pyramid-shaped salt crystals, characteristics of Maldon Salt, are soft and fragile enough to crumble easily between the fingers. Product quality is excellent, the production process is based on traditional salt-making techniques which date back almost two thousand years, but uses modern technology to ensure the highest levels of quality and consistency. Since 1973 Tidmanâ€™s range of salt products has been marketed by the Maldon Crystal Salt Company. Tidmanâ€™s range of bath, table, sea and rock salts is sold alongside Maldon Salt in supermarkets, delicatessens, chemists and health food shops all over the world. You can find Maldon Sea Salt at the Fresh Market for about $4.00. Thereâ€™s a lot of salt in there.